If you've read the blog for any amount of time, you've probably noticed that we like to give the independent publishers, designers, and developers a venue to share about their latest and greatest. We’re joined today on TOG by Darrell Louder, game designer and UnPub guy! Darrell, thanks for taking some time chat with us today! And thank you for having me… again! So the last time we caught up with you Compounded was still in the works. Where is the game today, and what do you have in the works for the future of Compounded? I am VERY pleased to say that Compounded has sold out, everywhere. Chris (my publisher, Dice Hate Me Games) and I took our personal copies to Origins in order to have stock. We sold out of every copy, including the display and the demo copies. So that's a nice warm feeling, to have your game sell out within 6 months of its release. As for the future, on August 1st Compounded: Geiger Expansion will go up on KickStarter. This will be the first full expansion for Compounded, which will also fund a second-edition printing. The Geiger Expansion brings in radiation to the lab, and a common "threat" to all the scientists. It adds in a lot more strategy, but also manages to trim play time down as it keeps everyone on a "clock," so to speak. I’m very excited about it--I can honestly say I can’t play the game without the expansion anymore. You’re Kickstarting Unpub 5. Tell us about Unpub 1 and how this whole thing got started! Unpub started back in 2011 as the brainchild of John Moller. He attended a small convention in October 2010 that had a few of unpublished designers and was amazed at the camaraderie they had. So he wanted to bring that to Delaware. So he started in a church meeting hall, in the backwoods of Delaware. 12 designers showed up and everything sort of snowballed from there. That is where I met TC Petty and his little prototype called VivaJava. That is also where Compounded was born. So it was a great moment for John and the attending designers. Does Unpub happen at/or alongside larger Cons or is Unpub its own gathering altogether? Both. Unpub has partnered with a few gaming conventions, PAX East, GrandCon, Congress of Gamers, and BGG Con. We want to do more, but funds for travel are tight. 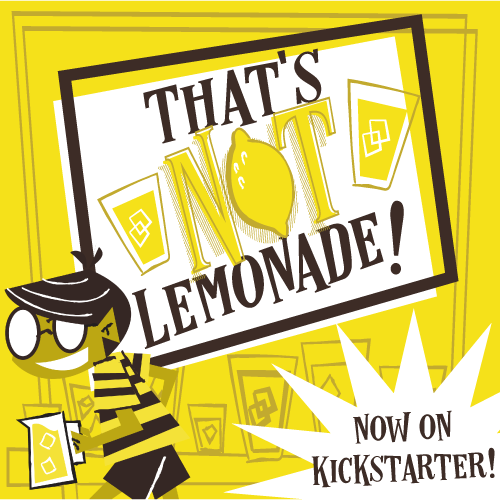 This is sort of another reason for the KickStarter. We want to be everywhere we can to help as many designers as we possibly can. We have the annual ‘stand-alone’ event: February 2015 is Unpub 5. That's the main reason for this KickStarter, but we've made it clear that the whole network is in need of funding, and I expect to have that all written out for everyone before the campaign is over. So where will Unpub 5 take place? Unpub 5 will take place in Baltimore, Maryland. Specifically Unpub 5 will take place at the Baltimore Convention Center in Baltimore, Maryland. It is a VERY exciting step for us considering Unpub 1 was in a church meeting hall, Unpub 2 was in an F.O.P. lodge, and Unpub 3 & 4 were in a high school cafeteria. We said at the conclusion of Unpub 4 that it was time for Unpub to put on the "big boy pants" and this move is sort of putting the first leg into those pants. So, if Unpub could brag a little, what are some games that have been discovered at Unpub that we possibly would have never seen otherwise? Unpub 4 alone had 17 games signed that attended the event. We try to get the games to place an Unpub Seal within the rulebook--but sometimes they get printed faster than we can send it to them. Unpub 5 has already funded! Do you have any stretch goals in mind? Well stretch goals are going to be focused on Unpub providing more things to the community: An iOS app, media kits, updated website, Unpub News and LivePlays, etc. I would love for Unpub to be a staple for every game designer--so every penny raised helps find time to add more things to make being a part of the Unpub Network as positive as possible. What events will make up this year’s Unpub? Well, for the most part it’ll retain the same events in years past: play testing, play testing, play testing. We're throwing in a box of new "tricks" though. On Friday, for instance, we have a Designer Day. It’ll only be for designers, publishers, and our new VIP play testers. We'll have a few panels and open gaming--then have a big Designer Dinner. It’s a chance for everyone to meet up and hang out a bit before the next 2 days of gaming. Saturday and Sunday are our "main event" with 10am-8pm play testing with the public. It really is the heart of Unpub and it’s everyone’s favorite part. I love seeing people experience these new themes, mechanics, projects--the intelligence in the room is just astounding. From 8pm to Midnight on those nights Unpub switches over to open gaming. So players can play whatever they like. We'll have a small Unpub Game Library, which will consist of as many Unpub "aided" games as we can get our hands on. So Unpub is growing, but we're becoming more streamlined and more organized. I couldn’t have done any of this without the help of some very special people. If you don’t mind, I want to ensure they get a shout out here. Stephanie Straw, first and foremost. She was the one who did the legwork to lock down Baltimore. She's just amazing and I fear where we would’ve ended up without her help. My wife, Lesley, for constant support and keeping me sane. TC Petty III, Chris Kirkman, and Mike Mullins for being a part of the Unpub board. It’s nice to have people to bounce ideas off of and get the differing reactions and opinions. Again, we wouldn’t be this far along without the volunteering and help of them. Aside from coordinating Unpub 5, what else do you have coming down the line? Any game designs you’re working on? I'm working on the Compounded: Geiger Expansion still--that work never ends until it’s off to the printer. I'm also working on a new game with my friend Mike Mullins, entitled Bottom of the 9th. It’s a baseball game that plays in about 5 minutes, but doesn’t skimp on theme, strategy, and game play. So keep an eye out for that one. Ok - It’s time for the lightning round! Time machine of choice: Delorean or Tardis? First of all, it’s T.A.R.D.I.S. ; it is an acronym meaning Time and Relative Dimension In Space. So show some respect. :) That also makes my choice incredibly obvious. Social games. I like games that engage the players to talk to each other. Nothing is worse than a table that is silent for 1-2 hours. New Teenage Mutant Ninja Turtles - Awesome or Oh no!?? Dark Helmet, 100% Dark Helmet. A big thanks goes out to Darrell for joining us today, you can check out the Unpub 5 Kickstarter here and help bring great new games to the market! And a big thanks to you for reading--don't forget to sign up below for our email list! You can win cool stuff!